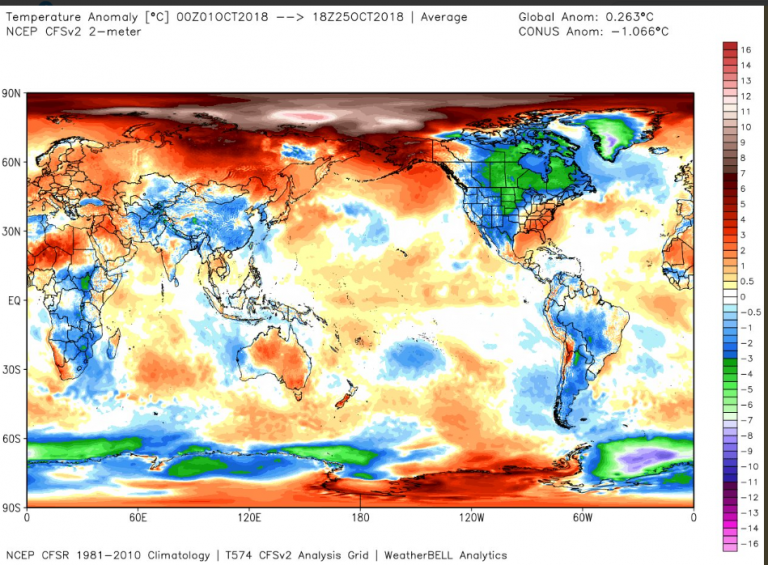 Browse: Home / 2018 / October / 27 / US CFSV2 Model “Horrible Bust” October Forecast …Month Ends Up Brutally Cold Across Western Hemisphere! Correction: It’s the CFSV2 that is “busted”, and not the GFS as mistakenly reported earlier. At his Weatherbell Saturday Summary here, veteran meteorologist Joe Bastardi takes a hard look at the US CFSV2 October-2018 forecast and compares it to what really happened. For energy dealers and those in the agriculture business, for example, the forecast was not worth the paper it was printed on. Instead of being warmer than normal, North America, South America and a vast area of Asia wound up being cooler than normal. The Arctic did the opposite – coming in much warmer than normal. Overall, Bastardi tweeted that the CFSV2 forecast was “a horrible bust”. Between the poles, the globe ended up seeing plenty of cold regions. Moreover, the ace meteorologist points out that Greenland looks to be the coldest October in almost a quarter century. For example, Kirye here tweeted recently that the temperature in Greenland plummeted to -62°F! Today, October 27, snow has been recorded over parts of England and Northern Ireland. Also see here, here and here. The forecasts show that snow is likely over much of Central Europe. 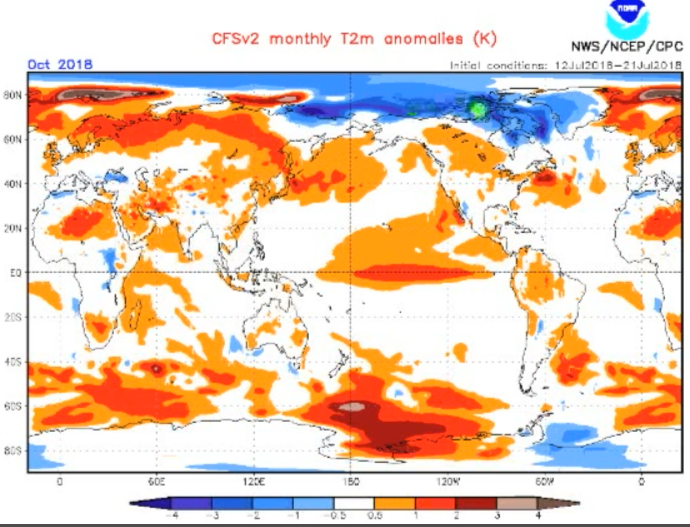 The veteran meteorologist also thinks NCEP’s December-February winter forecast is on really thin ice, as it predicts a warm winter for much of North America (2:42 mark). Later Joe shows that NCEP is now backing off their forecast. But we CAN ABSOLUTELY forecast the long-term climate on earth. So idiots and Western governments would believe. You know, the science of weather control attempts to exaggerate existing weather– for example, moving an existing front just a bit, or stalling it where it is. Well our existing climate’s cooling re solar conditions can also be exaggerated– by creating more “low clouds”. My observations indicate that this IS being done; chemtrails disperse to create overcast. I know how difficult it is to even entertain the possibility of chemtrailing. An exceptionally good propaganda campaign has vaccinated you against even looking. If your area is like mine, there is usually an opaque pall of bluish gray or even white, w little or no clouds. If you are too young to remember what the sky looked like 20 years ago, perhaps you have seen picture postcards of how it used to look. Following the next rainstorm that washes the sky clean, just LOOK at it; that’s how it used to look almost all the time! Within a day or two that overcast pall will be back, but if you are alert you will see the chemtrailing just half an hour before. As their trails fade, the sky becomes overcast. A few days ago I travelled to Scottsdale, Arizona where they are having their mild monsoon. Each afternoon there’s rain; consequently chemtrailing has been given up there until the rains end. It was such a spectacular saturated blue sky of such a high dome, w such fantastic white clouds, and the sun so hot w/o that pall to get in the way. On the way home, when I passed out of the monsoon area, I saw the chemtrailers at work and all was that depressing pall from there on. Just LOOK how you can’t see as far as after a rainstorm; that’s because there are suspended particles between you and the view. When conditions are suitable aircraft engines leave vapour trails which often spread to form what must essentially be cirrostratus cloud form. Mind you, I have seen plenty of pictures of aircraft like C130s leaving what could best be described as chemtrails while indulging in chemical warfare spraying the Vietnam countryside to kill all vegetation. The missions during Vietnam to spray agent orange from aircraft we’re flown at levels low enough that the aircraft were often hit by small arms fire. They were dubbed “Ranch Hand” missions and we’re primarily flown using C-123 aircraft and not C-130s. You never give up, you people, do you? I can never make up my mind which is worse, Seb with his science-free trolling or the conspiracy theorists and their fake moon landing / chemtrail obsessions. Give it a rest. Find something positive to say. Condensation trails or ‘contrails’ are white, cloud-like streams . . .
“The scientific debunker’s job may be compared to that of the trash collector. The fact that the garbage truck comes by today does not mean that there won’t be another load tomorrow. But if the garbage were not collected at all, the results would be worse, as some cities have found when the sanitation workers struck. So let us do our best to get rid of this ideological garbage, lest it inundate the earth. Our work will never be decisive, since old cults are almost unkillable and new ones keep springing up; but that is no reason for not doing what we can. If we can save even a few from the lure of the higher nonsense, our efforts will have been worthwhile. The big orange spot on the Sahara Desert made the cut. North America, where we live, didn’t listen to the GFS Oct. memo. The specific location here (central Washington State) has been, more or less, neutral . . . and looks to remain so into November. “Chemtrails” is the popular name for what is apparently metallic nanoparticles which remain suspended in the atmosphere. I, like you, thought it a ridiculous idea until about 5 Beggar’s Nights ago, when we had a cloudburst ending a long drought. The next day the sky was the one that I remember from years ago. I tried to think WHAT the rain had washed out of the atmosphere. This is a farming community, no industrial pollution. California’s control of automotive emissions is the best in the nation; nothing visible comes from our tailpipes. I’m only a few miles from the coast & we have excellent clean-air circulation from offshore, yet this stuff is suspended in the atmosphere. The propaganda is that the white trails we see are contrails, but they occur outside of normal air transport lanes. Often they curve & turn back. Fuel is far too expensive for any commercial freight or passenger aircraft to waste it by meandering around; they have a flight plan & they stick to it. I have a small background in aviation and learned far more than I needed to know about jet engines. If you look beneath that quarter-inch thick propaganda you’ll come to understand that real contrails are very short. Finally, I have watched on five separate occasions the normal blue sky w clouds be changed into the now usual overcast. On all 5 occasions chemtrailers had emitted their visible streams only half an hour earlier. If you don’t want to wait for a rainstorm, merely watch the color of the overcast: when it gets increasingly blue, it’s time for chemtrails to turn it gray or white again. If you just WATCH you will see the sky become less blue within half an hour of their streams. I submit, with respect, that certainty so great that it bars observation is dogmatism. In my experience we rarely persuade others, but we CAN get them to ENTERTAIN THE POSSIBILITY of ideas outside their knowledge. Then it is up to them to do their own research. In this case, the “research” required is mere observation. Robert & John, please reconsider. No change is causeless. Formerly we usually had picture-postcard skies of saturated blue w beautiful clouds. Now we have a shocking change– an overcast that is bluish gray or even white, and usually a complete lack of clouds. This change has a cause. I failed for years to notice this. I simply forgot what a normal sky looks like. Also I had occasionally seen such overcast days, so– absent memory– there was nothing to alert me, no perceived oddity. The sky was featureless, so I simply didn’t notice it. You need not accept my analysis of what it may mean, but it is impermissible for you to refuse ordinary observation & reflection upon this vast change in our environment. Not if you claim any commitment to Science, and especially to understanding climate. Where I live in New Zealand we don’t get a lot of jet planes in our skies. However a couple of years ago one winter morning I noticed a jet liner flying a holding pattern directly above leaving a continuous vapour trail. It made about ten orbits. It was a bright sunny morning with warmth from the sun. The vapour trails did not dissappear, but instead slowly widened to produce a complete overcast of cirrostratus cloud. The day became cold and dull as the sun’s energy was shielded by this icy cloud layer. This event was a great education of how human activity can affect the weather conditions in some manner. I was reminded of time spent in Europe hearing almost continuous air traffic an the possibilities for the skies there to be affected similarly. But aircraft seeding the skies with chemicals carrying out some dodgy agenda is not an idea I entertain, sorry! Jet liners do not fly a holding pattern except over airports, while waiting to land. If the chemtrails (metallic nanoparticles) were really contrails of condensed moisture they couldn’t spread out to produce an overcast for many miles. If you understood the jet engine you would understand the impossibility of the long “contrails” that we see– indeed of the rarity of even short ones. I’ll try to find a reference that explains this. If the chemtrails (metallic nanoparticles) were really contrails of condensed moisture they couldn’t spread out to produce an overcast for many miles. Yes they would and they do regularly. Anyway, there were studies about the effect of airplane traffic on the climate. They ran a big experiment in 2001 where they grounded all airplanes to test the theory. Thanks for the report of your observations. Could you specify the exact cloud types you are looking at? High level clouds cirrus etc. However it does not seem to me to be connected with planes manoeuvring above the International Airport. It may be cold temperatures higher up in the atmosphere as various weather systems move in as they do all the time in this latitude .The South Pacific is cold and many of our sudden wind changes come from there. Only in still conditions can we have clear blue skies. In all the places I have lived it is unnatural to have nonstop overcast. That is, before the chemtrailing began these places all usually had a high-domed saturated blue sky. The amount and type of clouds varied. There was of course occasional overcast. These places include Ohio; Arizona; NYC; Southern CA; Cape Cod; Guadalajara; Baja California; and Tepic, Mexico. This was my experience before the chemtrailing began. Indeed, I never saw a single chemtrail or contrail before the chemtrail-with-overcast syndrome began. Those of you who are old enough to remember: Did you in the past see contrails? Contrails are rare, and invariably short. Ask a pilot. You know how ubiquitous and persuasive to the uninformed is the AGW hoax. Yet you remain susceptible to the contrail hoax. There is no point in debating it when you have at your disposal the direct evidence of your own perception. Just LOOK. Penelope, am I old enough to meet your criteria? I am 82 years old. Re: “Contrails are rare, and invariably short.” In my experience, and going by the evidence, that is an erroneous assertion. Take a look, but, of course, when you have chemtrails on the mind, every contrail looks like a chemtrail. Thanks, Walter, for an interesting recollection. What I found most interesting in Joe Bastardi’s Saturday Summary video is that he stated without equivocation that the Atlantic is turning to it’s cold phase. IOW the AMO is heading towards negative territory. Contrails are neither rare nor “invariably short”. I see them pretty much every day streching across the sky. During WWII bomber pilots would diverge from the altitude breifed for the mission to try and avoid leaving such obvious visual markers. Even the British flying at night did so because it divulged to night fighter pilots where the bomber stream was. There are paintings by 19th century artists showing skies similar to what is ascribed to this nonsense. If you have an issue with any particular aircraft there are freely available apps which present the commercial aircraft location and dedignation….try it…. Honey, how could there have been contrails or chemtrails in the 1800s? If you mean the 20th century before chemtrailing began, please supply links or names of artists. This has nothing to do w commercial aircraft for the reasons cited above. I think he means Nineteenth Century painters in England painted similar greyish skies to those you have observed. So there would not be a correlation between aircraft and cirrus cloud layers. M E Thanks for the clarification. As I’ved stated, occasional overcast is quite natural. In some locations even seasonal overcast is natural. In most places the unremitting overcast we now experience represents a change from the past. If one actually compares the location of the chemtrails to that of commercial traffic it is apparent that these cannot be the result of commercial traffic. One can easily consult FlightAware or other internet sources to compare the time & location of chemtrails with those of commercial flights. A word about the term “chemtrails”; this popularized term was lifted from govt documents. I’m picking you are living on a large landmass?? Often clear skies for days on end? The difference between a “continental” weather system and an “island ” weather system is significant. Island weather such as NZ changes rapidly and often. Weather changes are often indicated by the cirrus clouds approaching from the west. The high icy overcast preceding a weather front. I have flown as a pilot for more than 30 years and one learns to study cloud types and their implications for piloting purposes. With regard to a comment you made about flying holding patterns, aircraft do not only fly a holding pattern above an airfield, as you contend. And with that, the discussion on the silly chemtrail conspiracy is over. NO MORE CHEMTRAIL comments please. Penelope, you have exposed a great and closely guarded secret from the past century. The bombs that the allies dropped were merely a distraction. They had nothing to do with victory. What REALLY won the war were the secret chemicals in the contrails the B17s were spewing. Come on Penelope. It’s just silly. See what Ian W 28. October 2018 at 5:52 PM writes, below. If it were true, THOUSANDS of people involved in the aircraft industry, from construction and maintenance to owners and operators in numerous sovereign nations, many not friendly to us, would know it. And still you think they could all keep it under their hat? Seriously? If it were true, THOUSANDS of people involved in the aircraft industry, from construction and maintenance to owners and operators in numerous sovereign nations, many not friendly to us, would know it. And still you think they could all keep it under their hat? Seriously? This is a kind of amazing reply from someone who thinks that climate data gets manipulated to show warming by also thousands of people involved. Of course “we” have not been able to keep it under “our” hat … all the “evidence” from climate gate emails, right? Go watch a TED talk, and make believe you learned something from it. PS – there are totally different protocals/mechanisms involved. Yet again SebH shows his ignorance and arrogance. He has nothing but fact-free assertions, and comments irrelevant to the topic at hand, but he just can’t resist being a pest, and inserting his worthless opinion. Hmmm. I thought Pierre had done a better clean-up job. Some progress seems to have been made, but not enough. I’ll be back when he finishes draining the swamp. Yonason, you have not read carefully. Nowhere have I suggested that chemicals are being dropped– only metallic nanoparticles which remain suspended for a few days. During this period the sky begins to revert to a pale blue. Maintenance chemtrailing then returns the sky to bluish gray or even white. Your reaction in transforming my allegations of metallic nanoparticles to some form of directly harmful, more dramatic chemical attack is EXACTLY my point when I say that the thinking public has been VACCINATED against considering the reality of chemtrails. When one wishes to discredit a scientist, one makes up lies about his integrity or his work. When one wishes to discredit the unmasking of an intelligence operation, one merely misstates what the unmasker is saying. If an intelligence operation really existed to spray metallic nanoparticles and people began to catch on, what wd the counter-operation be to hide it again? Why of course it wd be to make a fantastically unbelievable parody of the real operation being disclosed. How about spraying viruses & chemicals that alter the genes? Or mysterious filaments which you, too, have been infected with & which you can see merely by gargling w wine, then spitting it out? little effort. The next time you see a trail in the sky, notice the exact color of the sky. Check it again half an hour later, or just observe for half an hour. Caution: maximum change in sky color will be seen only if you begin w new, thin trails. Older, already partly-dispersed trails will already have begun changing sky-color. The most dramatic change can be seen when rain has restored the sky to its normal deep blue. But then you must watch carefully not to miss the chemtrailers & it may take as long as 1-2 days for them to come & tranform the natural sky to overcast. So that’s a nuisance, especially when you’re dogmatic that the phenomenon doesn’t exist. Probably a combination of mie scattering and optical illusion. But since Pierre asked us to drop it, that’s all I have to say on it for now. PS – The only thing I’m “dogmatic” about is the need for hard evidence, which is why I can’t accept human caused catastrophic warming or renewable ruinable energy. The evidence (good data a la Richard Keene) just isn’t there to support either, and there’s plenty that screams warning against the folly of the latter. And as if the paucity of data isn’t sufficient reason to be skeptical, when the lack is covered over with narrative and fantasy I can’t help but suspect mendacity. Airlines and aircraft manufacturers attempt to shave as much as possible off the aircraft weights. The amount of fuel carried is reduced to the minimum as ‘tanking’ fuel to the destination burns more fuel. Magazines and cutlery are reduced in size, everything is examined to reduce weight. Fuel efficiency is the way that aircraft fly extended range so the fuel composition is extremely important and engines are set to ‘cost indices’ to burn the fuel in the most efficient way at the best altitude for the Outside Air Temperature to be a cool as possible as the aircraft flies at the aerodynamically ideal altitude. Extreme efforts are expended to save a few kilos of fuel an hour. Anyone who thinks that this industry will carry extra weight of chemicals and ‘sprayers’ fitted to aircraft etc etc., will be easy to convince that the moon is made of green cheese. It is patent nonsense. Condensation trails are caused by water in the engine exhaust ‘condensing’ (hence the name) if the humidity of the air is too high for the water to remain vapor. If the air is cold enough the vapor trail will be ice crystals. If the humidity of the air is not quite 100% then the ice crystals will sublimate directly to water vapor and the contrail will disappear sometimes quite rapidly (known as non-persistent contrails). If the air is a mountain wave and the aircraft flies through the top of waves in a humid contrail layer then contrails will appear in the humid wave crest and disappear in the less humid air between the waves. If the air has high humidity but no cloud condensation nuclei then the water vapor in the air may become supercooled and not be able to condense. An aircraft flying through this supercooled air will leave a contrail and particulates in the exhaust will trigger the supercooled water vapor to start condensing this can lead to the trail growing into cirro-stratus clouds. This is all basic physics. I think what Penelope is talking about is deliberate contamination of the upper atmosphere by agencies unknown (but no doubt the CIA comes into it somewhere) for reasons which are not clear but will have something to do with discouraging the Russians / frightening off the extra-terrestrials / or subjugating the population. Take your pick! It is disquieting that TPTB may be purposely augmenting natural cooling while simultaneously cutting back on our ability to effectively use fossil fuels. If you believe that AGW is an “error” rather than a hoax, you might try following the money. The Senate report “The Chain of Environmental Command” is a good place to start. Do you really believe that those who create such a hoax are incapable of further wrongdoing? If naivete is the problem, I recommend any book by historian Wm Engdahl. Perhaps his footnoted book on the GMO phenomenon will awaken you. Most of us understand others through projection; it is quite difficult to imagine that there are others, raised in an ethos foreign to our own. Ian, you are quite right that commercial jets do not carry or spray metallic nanoparticles. Where wd they carry them– quite impossible in the fuel. Nor could they attach tanks, as these would be observed by the public at airports. Obviously it is military aircraft equipped w tanks that are doing the spraying. Nothing else is possible; one cannot put such material into the fuel. It is quite true that fighter aircraft, uncorrected would leave contrails perilous to their survival, and for that reason are now equipped to prevent this. Fighters and commercial jets are not the same in this regard; there are mechanical differences. The contrails that you see all the time are chemtrails– metallic nanoparticles. The next time that yu see one, notice the exact color of the sky; in half an hour it will be less blue, more whitish. This is fun, thank you for showing us what skepticism looks like in some people. What is this “equipment” that prevents contrails, please? I’m afraid your paranoid conspiracy theory is just that. The argument that “they would say that, wouldn’t they” doesn’t hold water if only because there is no evidence to support your theory. And are they nanoparticles or chemicals? You can’t even agree on the composition of them. Some of you say one thing; some of you say another. This theory has been around since the mid ‘90s and nobody has got any sort of grip on it yet. You would think by now somebody would have told Wikileaks about it, no? It is… interesting how the northern end of Greenland and the Canadian Arctic archipelago (where temperatures are actually measured) can be cool while just a few kilometres north in the Arctic Ocean (where temperatures are not measured with any kind of regularity) can be sooo much warmer than normal. I have seen this before, where the models used for infilling always infill on the warm side. Use Goodle Earth to look at the Sahara Desert. Except for the mountains it is yellow/orange/red. The heaviest loads of dust appear to be emanating from near the Bodele Depression in Chad. In Asia dust originates in the deserts of Mongolia, northern China and Kazakhstan. Photos from above or on the ground are easy to find. I wonder where als the Arctic sea ice extent/volume posts went? Arctic extent is now super low for the time of year and ice volume is also lower than last year at the same time. So no cheering posts anymore that praise the “rebound” of Arctic conditions to normal? Oh, and Antarctica looks also to have lower than almost every past year except 2016. It’s even lower than in the 80s. Must be the Sun that is warming the poles / polar oceans, right? that’s not true. Arctic extent is great, and there have been consistently increasing surplus of freezing days as compared to melting days. Antarctica only shown ‘lower’ ice once GIA is applied. Look it up! And I definitely remember spring/summer when Pierre constantly posted updates about the ice volume. Where are they now? Did the numbers stop supporting the “skeptic” narrative? Hmm, the comment where I asked why there are no Arctic/Antarctic ice rebound posts anymore got deleted? Ice volume below past years? Extent far below past years for both poles? Not worth an article? temperature anomalies at the pole don’t mean much. The poles get cold. Very cold. Far below freezing. So when they appear to ‘warm’, they are still far below freezing. Alarmists think that the ‘average’ temperature is important, but it isn’t. Ice expands as it cools, forming an insulating layer. Extreme cold does not translate to an evenness of extreme cold as you go down through the ice. The insulation makes a huge difference. What matter is melting days vs freezing days. indeed, the entire idea that you can ‘average’ temperatures in any meaningful way when state changes are involved (water to ice and v. versa) is incredibly simplistic and i’m surprised no one has challenged it, since it would be very simple to experimentally verify the non linearity of the relationship between surface temperatures and total system energy. Summer temperature is important as well as how cold it gets during fall/winter (determines how much ocean water refreezes). Last paragraph of yours: everyone knows that, I hope. You can not think climate scientist do not know this, right?